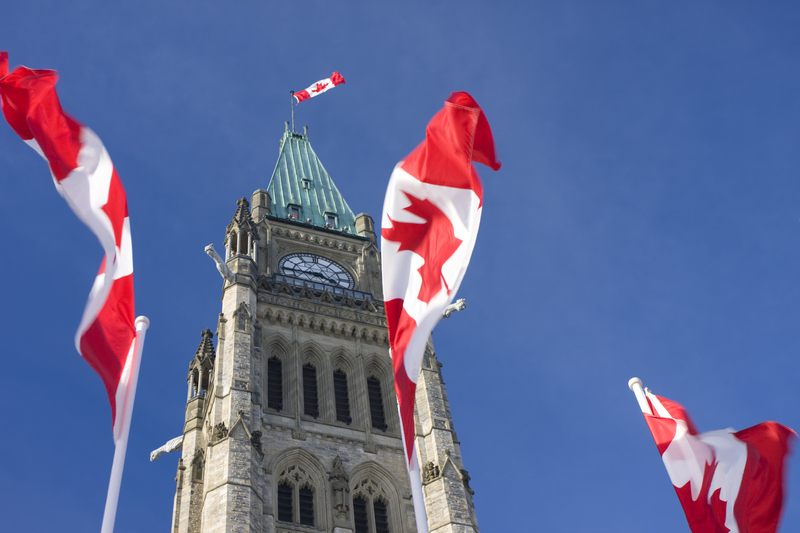 Canadian flags fluttering in the breeze, red and white splashed everywhere you look, parades, concerts, dancing in the streets: Canada’s capital city of Ottawa is celebration central for the country’s 150th birthday party on July 1, 2017. While special events have been held throughout the year to honour this momentous occasion, the biggest celebrations will take place on the weekend of June 30 through July 2, with British royalty joining in the fun. 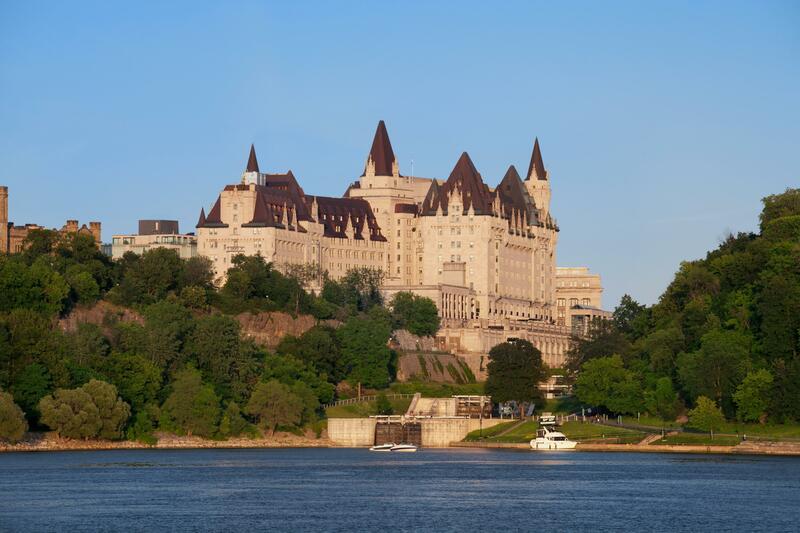 The majestic Fairmont Château Laurier provides the ideal base from which to enjoy the once-in-a-lifetime activities of this sesquicentennial birthday bash. Modeled after a 17th-century French chateau, the hotel’s luxurious accommodations provide a sumptuous sanctuary from the crowds while placing you at the centre of the festivities. If you're a hotel guest, begin your Canada Day celebration with an elegant breakfast at Wilfrid’s Restaurant. Take in views of the sparkling Rideau Canal as you indulge in warm maple crêpes with tangy berry compote, or eggs Benedict served with homemade elk sausage and a smoked paprika Hollandaise sauce. It’s only a short walk from the hotel to Parliament Hill off overlooking the Ottawa River, where the Canada Day party kicks off. 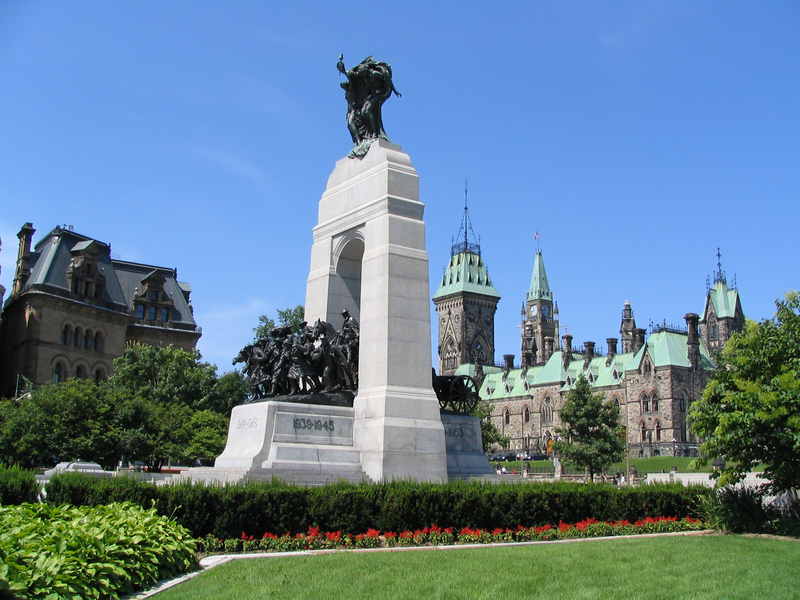 Arrive early enough to roam the grounds peppered with sculptures of famous Canadians. Stand at one end of the Whispering Wall and whisper secrets for a friend to hear crystal clear at the other end, or take a guided tour of Parliament's elegant Gothic-style buildings and witness unparalleled city panoramas from the Peace Tower. 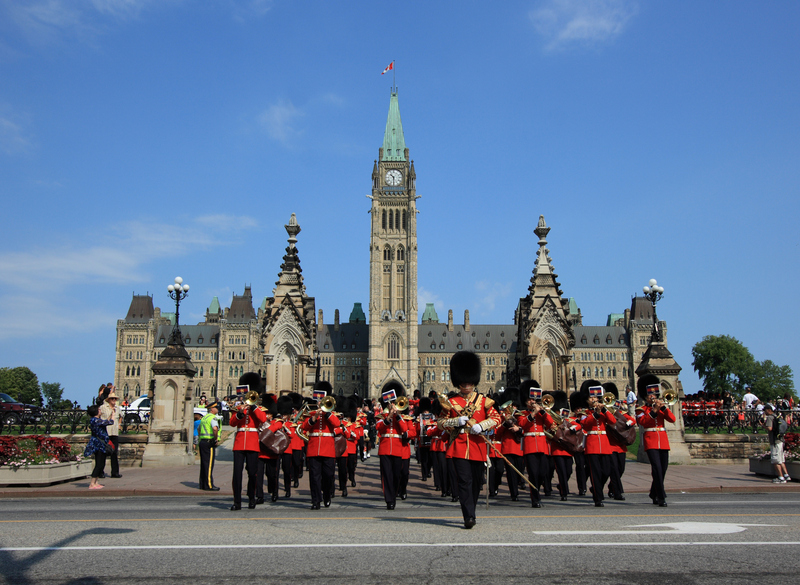 Secure a good vantage point near the Centennial Flame or the National War Memorial before 10:00 a.m. to witness the ceremonial Changing of the Guard, with its colorful display of pomp and pageantry. Music from the regimental band and bagpipers fills the air as the red-coated Guard marches toward Parliament Hill. Afterward, witness the inspiring Opening Celebration with the Prime Minister and Their Royal Highnesses the Prince of Wales and Duchess of Cornwall. Look up as Snowbirds and CF-18 aircraft swoop, dive and soar through the Ottawa skies in unbelievable feats of synchronized aerobatics. Keep watch to see if you can spot Royal Canadian Air Force Captain Kutryk’s specially painted CF-188 Hornet honoring Canada’s 150th anniversary of Confederation. In honor of Canada’s sesquicentennial, most museums will offer free admission. 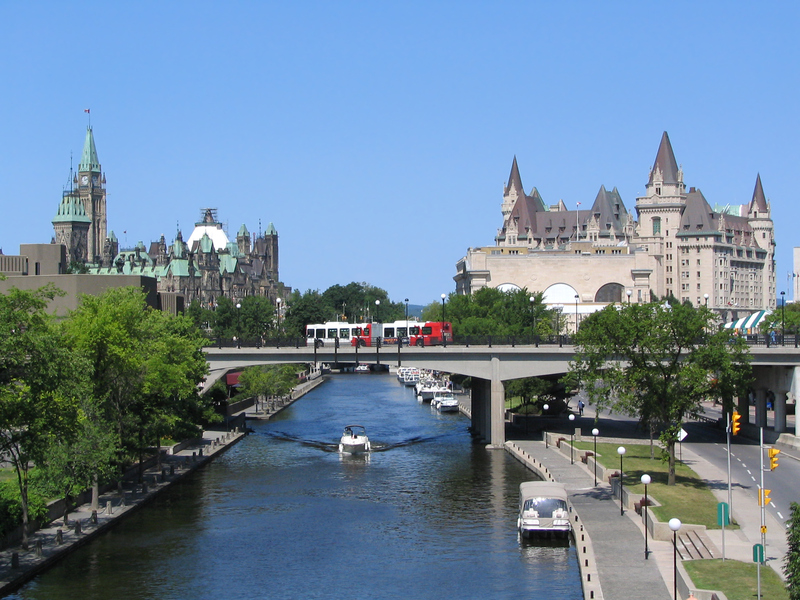 From Parliament Hill, you can walk to the nearby National Gallery of Canada and National Arts Centre. 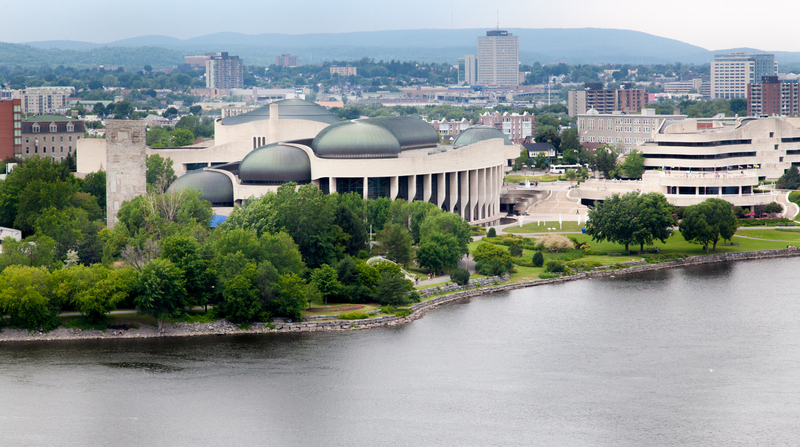 At the Canadian Museum of History, explore the new Canadian History Hall, where the exhibits reveal the struggles and achievements of Canada’s past through the diverse perspectives of the people who were there. On July 1st, between 10:00 a.m. and 6:00 p.m., a free shuttle carries people between the Canadian Museum of History and Major’s Hill Park, where you can enjoy live concerts, hands-on demonstrations, and sports activities. Or stroll along the river from the museum to Jacques-Cartier Park, another hub of birthday-related festivities. Be sure to view the park’s spectacular public art exhibition, MosaiCanada. This unique masterpiece combines the structure of sculpture with paint and horticulture in a living work of art to highlight elements of Canadian culture and history. For another view of Canada's culture and incredible diversity, visit Inspiration Village in historic ByWard Market. Within the village constructed from transformed sea containers, you can sample cuisine from across the nation, embark on a guided virtual tour of Canada’s natural and cultural treasures and take in live artistic performances drawn from every province and territory. Don’t miss the village photo booth, where you can dress up in Canadian-themed costumes and pose for a photographic memento of your visit. If you’d like to dive into an authentic Canadian experience, Fairmont Château Laurier overlooks Rideau Canal. This beautiful waterway offers some of the best paddling in Canada, and your concierge can arrange for a canoe or kayak adventure for you. And in honor of the country’s anniversary, lockage is free throughout 2017. Enjoy memorable family moments as you seesaw, slide and swing from one of the longest monkey bars in the world at Canada’s Biggest Playground in Mooney’s Bay Park. Featured on the TVOKids show 'Giver,' the 50,000-square-foot Canada-shaped playground was designed by children from across Canada. Thirteen different play spaces reflect the unique culture and geography of Canada’s 10 provinces and three territories. Once the sun sets, prepare to witness the most magnificent fireworks display in the history of Canada. The explosive show will be launched over the Ottawa River from Nepean Point, just behind Parliament Hill. If you happen to be staying at the hotel, one of the best (and lesser known) viewing spots is La Terrasse patio (open to hotel guests only on the evening of July 1st). This intimate setting offers views of Parliament Hill and Rideau Canal, and it’s the only spot where you can order handcrafted White Rosemary Sangria as you marvel at the showers of colour lighting up the sky. For a more exclusive experience, reserve a private yacht and sail out on the Ottawa River for wide open views and your own private celebration. The skilled captain and crew handle all the details, while you relax from dusk until the end of the fireworks. To ensure your private spot on the river, ask your Fairmont concierge to reserve the yacht for you as far in advance as possible. And don’t forget to request tapas and desserts from La Terrasse to enjoy while watching the display.